This script is not (yet) part of the official GIMP distribution. You have to install it before use. This is the BETA version of the script. You can download it HERE. Filter 'Parametric Curves' applied. Gauss family . Using parametric functions, points are defined by their plane coordinates (x,y); using polar functions points are defined by their polar coordinates (r,t) where r is the radius (distance from origin) and t is the angle from the Ox axis. You may chose from either system. You can draw curves with various shapes, colors, gradients, rotate them, ..., make animated GIFs. 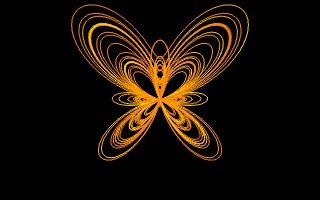 The script comes with a library of various parametric or polar curves. This filter allow to draw families of curves, each in its own layer. As usual with GIMP you can merge, delete, rotate, etc. curve layers for achieving best effects. You can find this filter through Filters -> Render -> Parametric Curves. 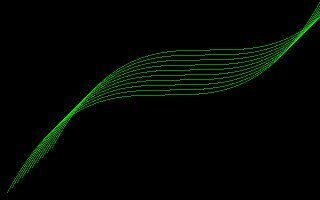 The Parametric Curves window let you chose curves from the library or program your own curves. He you will chose colors, shapes, .. and define curves functions. Chose this item before entering the curve definition and parameters (see 13.23.3.2). Then press OK to draw the curve(s). Chose a library curve then press OK to draw it. A pop-up message is displayed to show the library curve definition. The 4 latest *user definitions* are saved in History-1 to 4. You can reload and replay one of them. History-1 is the last one drawn. The dialog contains all options to set curves colors, calculation and select curve type (shape). Note that the script is able to draw at once a family of curves. See below, 'programming the curves' : loop(Cmax ...). 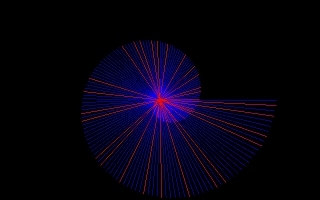 Each curve is identified by C in [1..Cmax]. The variable C may be used in any function. The color value will be the foreground color for the curves drawing tools. Select here a gradient for the brush tool. If 0 no gradient is used. Else the gradient is repeteadly drawn with the specified length. You can Browse... here for the type of brush to use for color or gradient, its Mode and Opacity. 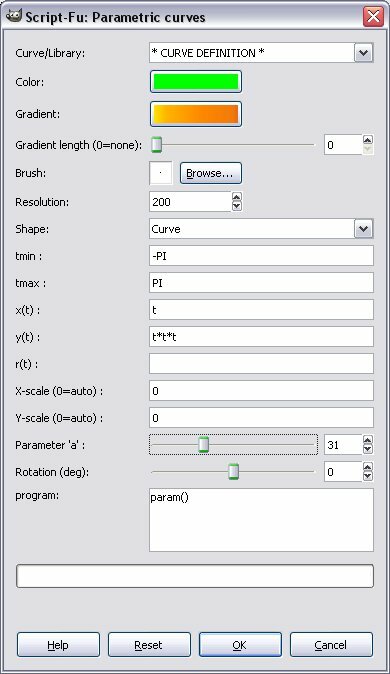 With this drop-down menu You can chose what curve shape will be drawn, for instance: Curve, Radial, Dots, Steps, Path or Cartoon. Standard curve: join the points with linear interpolation between two consecutive points. Dotted line: draw only points, no line between them. Radial: join the origin to the different points. Allows to 'fill' the curve. Nice effects is a gradient is used. Step: To draw discrete (integer numbers) curves. see Fibonacci in the library. Draws the curve in its own layer, then adds a path (SVG vector) to the image. You may then select, fill, edit, transform, export .. this path using the GIMP path tools. Animated drawing from point 0 to last point. No gradient is used. You can set the speed = display refresh interval, with the cartoon(speed) function. See 'Logarithmic cartoon' in library. Shortened to 60 seconds if too long. Input boxes to set curve functions definitions. Note that 'y(t)' means that y(t) is a function of t. It may depend upon other parameters (i=dot number, C=curve number, x, ..). It may even be constant. y=100 -> straight tight line. Used to set the number of points (dots) that will be drawn. GIMP will perform linear interpolation between these dots. Each dot is indexed by i in [0..resolution[ . Any function may use the integer value i. Points (x,y) are defined by means of the two functions x(t) and y(t). These functions use standard math. notation (see below). Eg 1+sin(3*t), cos(sin(cos t))), etc. Caveat Do not write 'x = sin(t)+t' in the box, but'sin(t)+t'. To define the curve by its polar definition r(t).r is the radius, i.e distance from origin for the angle t. Dilemn : if x(t),y(t) and r(t) definitions are given, r(t) is chosen. Note : It is the exactly the same to write r(t) = f(t), where f is some function, or x(t) = cos(t)*f(t), y(t) = sin(t)*f(t). If f() is a complicated formula, you write it only once. X-scale and Y-scale (pixels) give the maximum values for x and y along the axes. If X-scale = 0 (resp Y-scale = 0) the values are computed in order to fit to the window width (height). If polar coordinates are used, Y-scale is set to X-scale. This slider sets the value of the variable named 'a' which may be used in curves definition. Usage : set 'a' and click OK (draw); set another value and redraw etc. These functions let you set define curves in ordinary mathematic notation. Eg : sin(t), cos(PI+3*t), .. These functions may use the provided (read-only) variables x, y, t, R, ..
even(n),odd(n)  is n even,odd ? The script will display information messages using GIMP pop-up messages. You can use the Windows->Dockable dialogs->Error console dialog to display/copy/.. the messages and curves definitions in the console window. With the "program" textbox you can draw families of curves, script usual operations, dynamically override curves settings, and animate GIF's. Overriding of values applies to library or dialog curves. Yes, this is a script language inside the script-fu. Executed Cmax times - Cmax layers are built. Build Cmax filled (background color) layers for animated GIF's in replace mode. Build Cmax transparent layers for animated GIF's in transparent mode. The do(..) functions are the following, and are executed BEFORE the curve drawing. They may take into account the C curve number in [1...Cmax]. 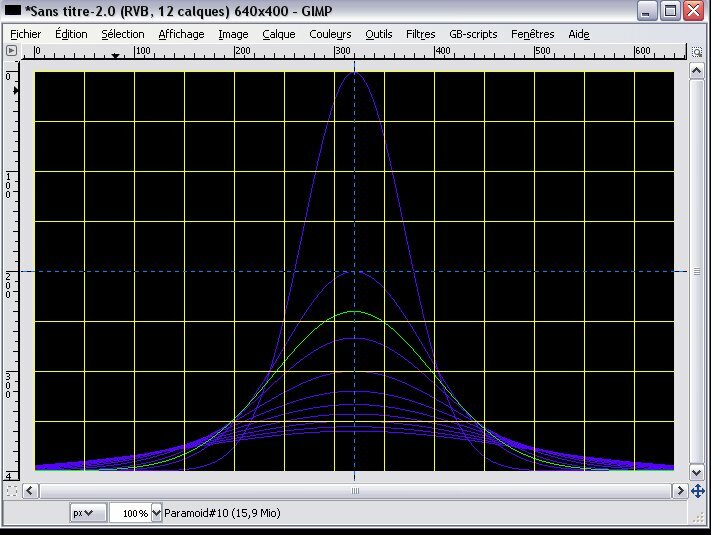 Sets drawing color to i-th sample from the gradient. A number of parameters  may be used in formulae for x(t,..), y(t,..) or r(t, ..). This allows to draw families of curves. P(i,v)                -> sets value v for parameter P(i). 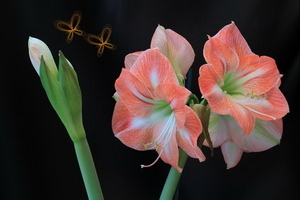 Return v.
Add two layers to the flower picture, using the 'butterfly curve' from the library. Shrink, rotate and move these layers with the GIMP layers tools. It's done.